“The Vinegar Works: Four Dances of Moral Instruction” is a perfectly realized dance theater performance, and a perfect ending for the Trey McIntyre Project’s farewell tour. Ten years after the company’s formation, the TMP will disband as a full-time company to allow its co-founder and creative wiz, Trey McIntyre, to focus more on new media, film, photography, and writing—the seeds of which can be glimpsed throughout his multidimensional world premiere. Inspired by the work of illustrator and writer Edward Gorey and set to Shostakovich’s haunting piano quintet in G minor, this creative production also incorporates puppets created by Broadway’s “Lion King” mask designer, Michael Curry. The highly fashionable mashup-period costumes of Bruce Bui and painterly lighting design by Raquel Davis are equally significant components and contributors in this gothic, graphite in tone, surrealistic dance theater. 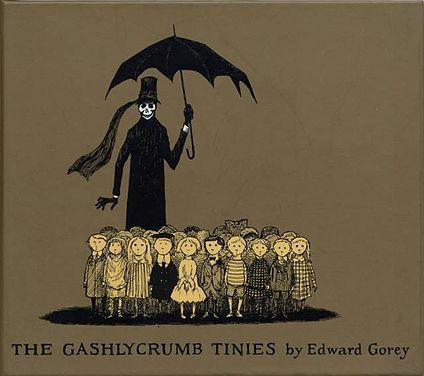 The “Four Dances of Moral Instruction” are each announced with the holding up of a title card and are distinguished as; “The Gashlycrumb of Tinies,” “The Beastly Baby,” “The Deranged Cousins,” and “The Disrespectful Summons,” which come directly from the dark romantic images and “literary nonsense” of Gorey. The performance starts with a scratchy recording of text narrated by Alan Cummings that instantly sets the audio tone of Gorey’s absurd sense of humor and gothic morbidity. To that phonographic overlay, Brett Perry dances–spot lit and framed by a thinly draped curtain. The choreography is a blend of precision ballet, mime, and gymnastics that reinforces the one-dimensionality of Gorey’s illustrations. Perry’s long limbs and lines are perfect for replicating the accentuated lines common in those renderings, as is his naturally boyish and innocent look—a central theme in Gorey’s work that juxtaposes ghouls and goblins with innocence and ingénues. Upstage from Perry, standing nearly three times his size, lurks Gorey’s iconic grim reaper, complete with top hat, waving scarf and long black cloak. Death is both puppet and set, animated as if by a person on stilts. It floats among the dancers as one of them and they unwrap its cloak to create a canopy tent that grotesque figures emerge from or as the black void that sooner or later consumes all into its dark mystery. The various acts flow seamlessly one into the next with different characters: ghostly nuns, masked creatures, and puppet eagles flying through the stage. Perry’s stellar technique and energy ties all the acts together before finally succumbing death as this impressive theater comes to an end.